-Please handle this product with care to avoid damage to the bulbs. -If hanging, please ensure the hook has some extra space for easier operation on the switch. -Store the light in a cool and dry place and remove batteries if product is not to be used for a long time. 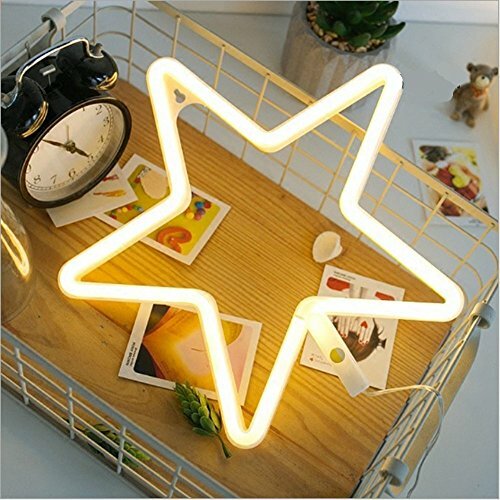 Unique Design: Lovely Neon "Star Sign" decor light is a wonderful solution for your small room decoration. Beautiful and modern decorative neon lamp. Add vitality to that bed side table with this neon decoration and provide you with a romantic atmosphere. Easy to Install: There is a hole behind the lamp that can be hung it on the wall or place it on the table. Cordless light up, quick and easy to install. Material: LED neon light is made of high quality PVC material, long time using not hot, safe, environmentally friendly, non-toxic, no risk of glass breakage or leakage of hazardous materials. Power Support: Battery-powered, requires 3 AA batteries (Not Included), ON / OFF switch on the battery box. Widely Application: Perfect decoration for the bedroom, living room, balcony, children's room, restaurant, party, birthday party, wedding. A fantastic neon art lamp replaces the boring desk lamp and adds color to the darkest room. If you have any questions about this product by EONSMN, contact us by completing and submitting the form below. If you are looking for a specif part number, please include it with your message.